My Writing Lockdown continues apace, but I do have to emerge from time to time to fulfill other scholarly obligations. Below my draft of a review of Carolyn Dinshaw's How Soon is Now? for Clio. The journal has a theory-savvy interdisciplinary readership, so I do not focus on the book as a contribution to medieval studies but to the critical humanities at large. My thanks to the students of Environ Body Object Veer for their thoughtful symposium on the volume, and to Rick Godden and Eileen Joy for reading early versions of this piece. Now let me know what you think. How Soon Is Now? Medieval Texts, Amateur Readers, and the Queerness of Time. By Carolyn Dinshaw. Durham: Duke University Press, 2012. xix + 252 pages. A groundbreaking scholar whose work has long been as important outside the field of medieval studies as transformative within, Carolyn Dinshaw turns her attention in her third monograph to the textual and lived complexities of being in time. Bringing her ongoing research on medieval texts, cross-temporal community, gender and embodiment, postcolonial desires, and the queer into an ongoing critical conversation on how time itself is thick with difference, How Soon Is Now? is a cumulative and synthetic project that also maps significant new ground. Through the figure of the amateur Dinshaw explores powerful moments of asynchrony within late medieval English works, especially as these works are framed and desired by nineteenth and twentieth century nonprofessional readers. At such moments may be glimpsed the irreducible heterogeneity characterizing all temporality, rendering time (like the amateur who loves history too much) disjunctive, queer. 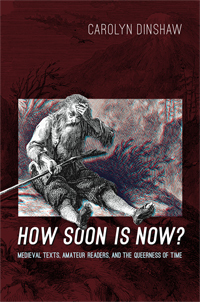 How Soon Is Now? builds upon and deepens Dinshaw’s mapping of trans-historical community in Getting Medieval: Sexualities and Communities, Pre- and Postmodern (1999). This book is just as learned, just as marvelously connective, but looser in structure, wider in scope, and deeper in its affective texturing. Most chapters are structured as triptychs: an erudite examination of one or more medieval texts is followed by a reading of these same materials by an amateur figure (real or fictional) and then juxtaposed with an autobiographical narrative that intensifies the chapter’s themes and enmeshes the late medieval, the nineteenth and early twentieth centuries (when most of the amateur readers considered lived), and the present. Among the medieval texts Dinshaw considers with her characteristic insight, verve and good humor are two works long familiar within her oeuvre (the Book of John Mandeville and the Book of Margery Kempe) as well as a sermon from the Northern Homily Cycle about a monk who steps into the distant future; the legend of the entombed Seven Sleepers; the curse of King Herla, who cannot alight from his horse without time rendering him dust; and the Kingis Quair of James I in its intersections with Chaucer’s translation of Boethius’s Consolation of Philosophy. A compelling examination of “the present power of past things, past bodies, past lives” (148), the medieval portions of these chapters also tend to be exclusively Christian in their interpretive ambit, so that I sometimes wondered if their queerly and resolutely out of time figures were not signifying slightly more challenging narratives about the heterogeneity of the Middle Ages. The Book of John Mandeville even contains a powerful Jewish story involving the antichrist – and as Israel Yuval has argued, the Christian antichrist is the Jewish Messiah. The tale could have been unpacked at greater length to detail asynchrony’s more than Christian complexity, especially because that chapter culminates in a conversion narrative close to home. The book concludes with an epilogue containing a compelling section on the relation of race and fantasy to asynchrony. The theme is latent from the introduction, though, a riff on the singer Morrissey’s lyrics as trigger to thinking temporal thickness. The former singer of The Smiths, Morrissey has deployed possible far right imagery in live shows and made some potentially racist statements (noted in a brief footnote when discussing the complicated relation of Latino audiences to Morrissey’s music). Dinshaw even stages an imaginary meeting in the chapter between the singer and Martin Heidegger, a conjunction that will bear for many readers an undercurrent of asynchrony’s darkest side. Non-affirmative trajectories of perceived out-of-timeliness, especially in relation to race, must always be potentially present, and could usefully have been plumbed earlier in the book – especially because Dinshaw argues convincingly that through a creative refiguring of nostalgia (as critique as well as yearning), asynchrony can yield a vision of a more attached, more just world. The anchoring of each chapter in the personal foregrounds what Dinshaw calls her “queer kinship” with the amateur through her own “uncertain progress and uneven development as medievalist and queer” (32-33). These autobiographical moments include a meditation on the ambivalence of growing up with a Parsi father who assimilated into Anglo-American culture and religion; an examination of the material histories conveyed when a gravestone is propelled by flooding rains onto her property in the Catskills; memories of undergraduate days at Bryn Mawr in their uncanny intersection with an important archival discovery she makes while conducting research at the Bodleian; and the admission that she fears when she lectures that she might be out of place and time. A renowned scholar, the former president of the New Chaucer Society, a senior professor and accomplished administrator at a prestigious university, as well as a revered speaker who always packs a room, Dinshaw confesses that she feels at times like an amateur. Given her secure position, she writes, such an admission might seem facile, but she emphasizes that the “current atmosphere of professionalization in the university” does not give great hope for future stability, and the affective turn in medieval studies (a movement which she has been fundamental in precipitating) has not always been well received. Her project in How Soon Is Now? is therefore to attempt to “help in the development of different conditions” (32), and her emphasis upon changing the circumstances under which the scholarship of those who follow after her might be conducted is admirable. Her most quotable line is, to my mind, her succinct mission statement, provided at the end of the introduction: “I want more life” (39). Dinshaw’s amateur is a complicated figure. At its simplest, the amateur (from Latin amare) is one who loves: that is, one who pursues a project or an obsession ardently, motivated by desire rather than the lure of remuneration or fame. Professional expertise is associated with knowledge as a commodity, not shared but sold. The amateur shows us the way to what Dinshaw has labeled elsewhere “post-disenchanted” modes. The amateur loves the past with queer enthusiasm, and is therefore a little bit embarrassing, a little bit out of time. Although like the queer dismissed as immature, underdeveloped, and improperly seduced by or attached to objects and histories, the amateur is not so easy to pin down, and does not form the second term of a neat binary. The professional and the amateur do, after all, share desires. Among the amateurs who populate How Soon Is Now? are professor and poet Henry Wadsworth Longfellow, who penned a verse drama about the monk who steps far into the future; fairy tale collector Andrew Lang, “highly educated but not an academic,” impersonating John Mandeville; M. R. James, eventually provost of Eton, but as a Fellow at King’s College the author of his own Mandeville parody (lampooning the rigors of Germanic philology) as well as the writer of numerous ghost stories that materialize uncanny relations between past and present; Hope Emily Allen, whose endlessly proliferative mode of connection making ensured that she never finished the second volume of her edition of the Book of Margery Kempe; Geoffrey Crayon, Washington Irving’s fictionalized self-representation in The Sketch Book, an out-of-time American admirer of King James’ Kingis Quair; and Thomas Colpeper, a Chaucer-loving and rather deranged country magistrate in the film A Canterbury Tale (1943). Each of these amateurs is an astute reader of a late medieval text, demonstrating how thick with various time frames such texts were and remain, as well as how active these narratives prove as they move through the world, drawing readers into their orbits, generating “a vibrantly asynchronous now” (77). Not everyone who feels out of time will offer through their ardency some utopian promise, of course. How Soon Is Now? makes this point clear through references to the self-perceived belatedness of the Nazis and an examination of Thomas Colpeper’s violence against women. Most of the amateurs Dinshaw treats come from privileged, highly-educated backgrounds. They are also mostly figures from the past. If professionals are those who are paid for their work, so that their time resembles their money (“abstract, objective, and countable,” 21), then for many reading this book the professional will be recognizable as a denizen of the board rooms or classrooms of corporate and increasingly globalized universities, thriving under STEM obsessed administrative regimes, publishing books in venues so expensive or elite that amateurs have little access. The time and resources that this contemporary class of knowledge distributors requires to produce and commodify their research often comes about through a reliance upon adjunct labor: scholars who are well trained, but whose substandard wages, absence of benefits, and lack of access to work space, travel subventions, and research funding effectively exclude them from the category of the professional. Dinshaw is acutely aware that to be an amateur is not to be outside capitalism, and that the state is not be romanticized, especially because to do so plays into neoliberal dreams of a flexible, creative, cheap workforce (23). She suggests that amateurism operating “outside, or beside, the culture of the professionalism provides an opening of potentials otherwise foreclosed” (24). Many of us know this space of adjacency as the para-academy: not outside the profession, not separate from the university, but alongside, a space for invention and proliferative alliance, changing the intellectual landscape through blogs and social media, open access publishing, and other nontraditional modes of sharing knowledge. How Soon Is Now? opens with a meditation on professionalism, anachronism, and creative amateurism spurred when the author spots a young man in a bathrobe attending the Medieval Festival at the Cloisters. The possibility that he might be a “simple, unconscious naïf loose in the park” is quickly rebuffed when Dinshaw notices that he is taking notes, perhaps conducting his own research (xiv). The vignette is accompanied by two alluring photographs of the young man. In the first he plays a recorder with his back turned, while in the second he appears lost in his notebook. These images are credited to the photographer Marget Long, Dinshaw’s partner and the dedicatee of the book. The pictures quietly gesture towards the companionship and conversations that animate the wide-ranging discussions of How Soon Is Now? – and I love this gesture towards the sustaining power of collaboration. In a compelling moment of self-reflection Dinshaw turns her “professional gaze” away from the young man in his bathrobe and wonders if the notes he writes “were on me” (xv). It’s impossible to read the passage and not be convinced that amateurs (who often do not choose their status, who often lead precarious lives) ought to be part of a wider, boundary-crossing conversation. It’s also impossible not to wonder what would have happened if the young man in the robe had been asked what brought him to the Cloisters, what he was writing, what more life might mean to him. He and Dinshaw are, after all, the books only two living amateurs: what would their collaboration look like? How Soon Is Now? is scholarly, eminently readable, and insightful. Creative in its structure and wide in its ambit, Carolyn Dinshaw’s long awaited book cogently argues that the now we inhabit is denser with possibility than we have imagined – and that medieval writers as well as their amateur readers have known this conjunctive truth for a long time. The book is required reading for anyone interested in the intersections among history, community, textuality, sexuality, writing, dreaming, loving – that is, for anyone who cares about the humanities today.